Solar Panels are a very powerful way to reduce your energy costs because they allow you to create your own power. The problem is that solar panels are expensive to buy and install. These costs are going down as the technology improves but there are ways of reducing the price tag even lower through financing. This initiative is the idea of having the association organize different group financing methods such as group buying in bulk and investment plans. Solar panels are important because they give homes energy independence from the grid and can dramatically reduce the need for power from the grid. Panels high up front cost can be a big barrier to people purchasing them but once purchased panels can pay for themselves in a matter of years depending on the amount of sunlight the panels receive. These different financing methods can help you get the money to pay for the upfront costs so you can enjoy the long term benefits of going solar. Here are two maps of the solar potential of the target area. These maps are determined by how much sun light the area gets minus any shading caused by trees and buildings. Solar panel placement is vital to getting the most energy out of the panels. 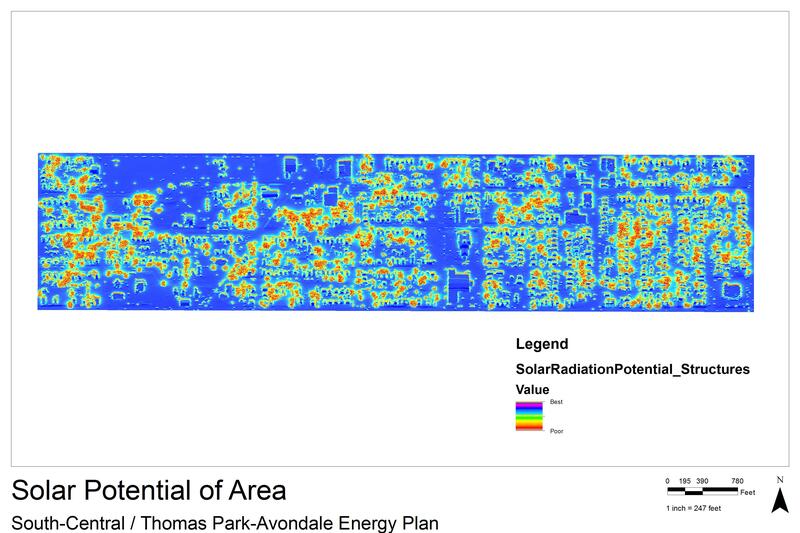 The first map shows the solar potential of the buildings in the area. The second map shows the solar potential of the total area in the area. There are a variety of ways to finance solar panels with many programs available from many different sources. Each program has different requirements and different amounts of funding. Listed below are a link to different sources. This report will help get the information you need to help apply for these programs. Many of these programs are based around the individual but another area of financing could be group financing for solar panels with the association acting as a organizational center for groups of neighbors getting together to buy for solar panel installation at more bulk prices and would cut down on labor costs since the installers could do multiple homes in one trip. The association could create a fund that everyone who is interested in the panels can contribute to the fund and the association make the purchase in bulk. 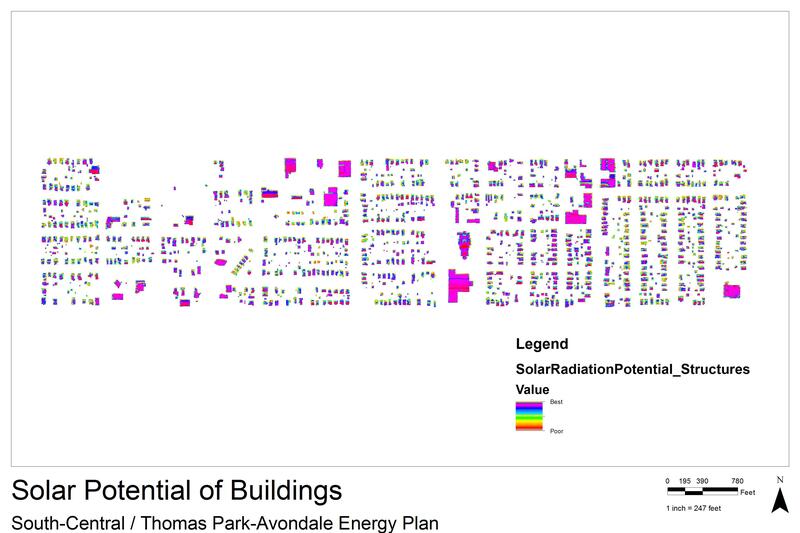 This is the solar potential of the buildings. This map was isolated from the previous map to give a better view of how much potential is in the rooftops of the residential and commercial property in the area. In this map Purple is the best and red is the worst for solar use. The above map shows the solar potential of the area. The blue is the buildings which have a good potential for solar energy while the red is mostly tree cover that creates poor areas for solar. Describes the energy program known as net metering where any extra energy made by the panels that the house doesn’t use goes to the grid and the utility company pays the homeowner for the energy. Describes another fiancing system known as third party financing that all involve having someone else pay the upfront cost of the panels and the homeowner paying it back off over time. Information about the costs and savings of solar panels in Indiana both from the energy savings and programs to help pay for it.